A team of scientists from the Wildlife Conservation Society recently completed the first-ever range-wide population census of the Zanzibar red colobus monkey. This species is found only on the Zanzibar archipelago off the coast of East Africa and is one of the world’s many endangered primates. The census, published in Oryx, did bring some good news. The results showed that there are more than three times as many Zanzibar red colobus monkeys (more than 5,800 individual animals) than previously thought, and many more monkeys living within protected areas than outside of them. However, the bad news is plentiful. Survivorship of young animals is very low, the species is now extinct in four areas, forest habitats on which the primates and others species depend are rapidly being cleared for agriculture and tourism development projects and hunting is common. In order to gain a better understanding of the status and ecological needs of the Zanzibar red colobus monkey, the team spent two years (4,725 hours in the field) searching for and observing them. The surveys occurred both within and outside of protected areas on the main Zanzibar island of Unguja, and the scientists employed a new sweep census technique to collect data on group sizes and structures, demographics, and locations with the help of GPS devices. The results provided proof that Zanzibar’s protected areas are working…to some extent. 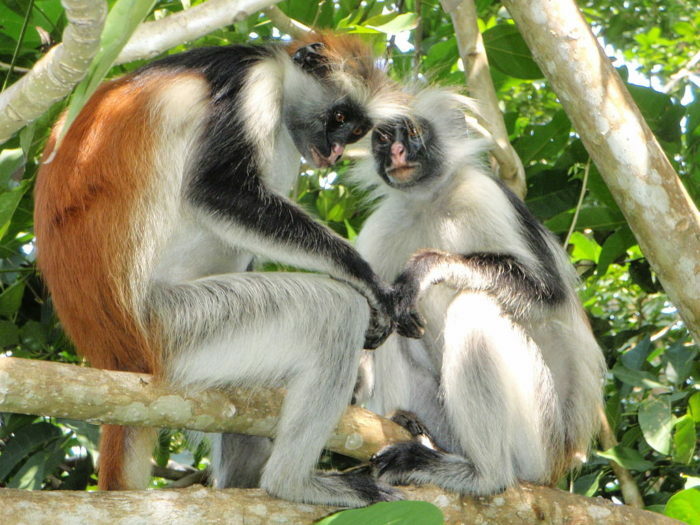 Sixty-nine percent of the population of Zanzibar red colobus monkeys live inside Unguja’s protected area network, and monkey groups found within protected areas boasted both higher average group sizes and more females per group. Conversely, the assessment also highlighted challenges for conservation, especially for the more than 30 percent of the monkey’s population that live outside of protected areas. 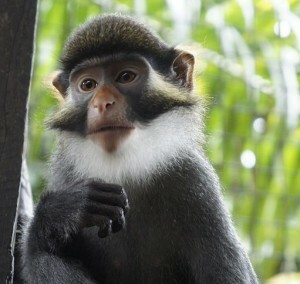 The scientists discovered that four of the forests previously known to contain Zanzibar red colobus monkeys no longer do. Four other locations were found to contain only one family group, which are unlikely to survive in isolation. One of the largest threats to the Zanzibar red colobus monkey is deforestation. Forests on Unguja are being lost at a rate of more than 19 square kilometres per year due to agricultural activities, residential development and human population growth. The hunting of monkeys for food and retaliation for crop raiding is also concerning. The result of the study were recently presented to the Zanzibar government. The authors recommend creating a new protected area to further safeguard the Zanzibar red colobus monkey as well as increasing primate and forest tourism operations. Another suggestion is to make the primate the official national animal of Zanzibar. WCS will now work with the Government of Zanzibar to initiate a flagship species programme that will protect both primates and the archipelago’s remaining forests. 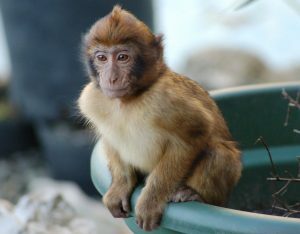 Barbary macaques once stretched throughout northern Africa and southern Europe, however populations have suffered a major decline in recent years existing only in isolated areas in Morocco and Algeria. 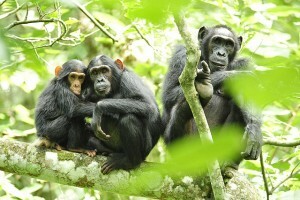 Chimpanzees are under threat from many human activities there are only around 6,000 individuals of the Nigerian-Cameroon chimpanzee subspecies are left in the wild. 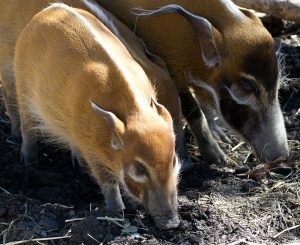 A new study has found that hunting for the bushmeat trade has dramatically reduced wildlife biodiversity in the forests near rural villages in Gabon, Central Africa.